Climbing on rooftops for the 11th time-but I had more fun than ever this time around. One of Odyssey 's many varied environments. I've been a dedicated fan of the Assassin's Creed video game franchise for 11 years. It has not always been a happy relationship. While the early games captured my imagination and introduced me to whole new modes of gameplay, the series' middle years were laden with misfires, feature bloat, and other serious problems. I often look at fans raging against the companies that make their favorite franchises-Bethesda or Blizzard are the two most common targets I see-and shake my head in bewilderment. "If you hate their work so much, why do not you just play something else and let everyone else enjoy their games? It's not like there's a shortage of great games to try," I say. My ups and downs with the series reached a new zenith with this year's Assassin's Creed Odyssey . Just as I was giving up on one of my favorite franchises, this reinvention gave me the feels I had not had since the series' best days (that means the Ezio Trilogy by the way). And while the deepest heart of the new game was still Assassin's Creed, Odyssey was a wild departure. But that's OK. Because by tossing out the old ideas about what this beloved franchise was, Ubisoft actually saved it from doom. What you're about to read is not a review-Ars already did that. This is just a super-fan putting his geek-out hat on to ponder why Odyssey worked so well where other recent Assassin's Creed games did not. If you're just interested in Odyssey you can skip ahead- this will be bloated and lengthy, just like a modern Assassin's Creed game. You probably will not agree with all my takes. That's OK, it makes for a good conversation. Think of it kind of like a "best and worst" list without firm rankings. Also included here: a link to every main series Assassin's Creed review ever published on Ars. This was a janky, broken, frustrating mess of ideas. The potential was there, and I was enthralled, but Assassin's Creed was not always fun to play. Still, it was a revelation. I could see what it was going for, and I loved it . How often did a triple-A game come along that tried this many ambitious new things? Even if it did not always work, you had to respect the game for trying during a time when it felt like almost every big release was a Call of Duty Grand Theft Auto or God of War copycat. 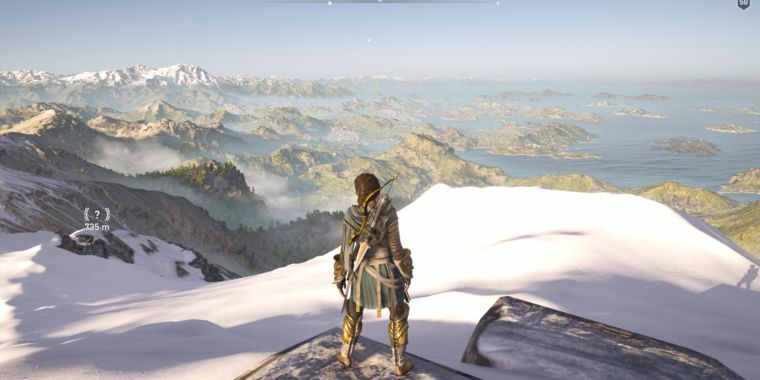 Today, the series has a reputation for aping the best ideas from other franchises and adapting them for the Assassin's Creed formula, and that's accurate. But sometimes we forget that the first game actually was truly inventive. It was not just imitating other games-at least, not other triple-A ones. While the first version of anything usually falls short and this title was no exception, I warmly remember it for its ambition regardless. I'm just glad the future titles made it so falling in the water would not immediately kill you, you know? Unlike the first game, you would not instantly die in water. Needless to say, this was nice to see. What follows two years later was one of my favorite games of all time. I virtually never play games multiple times through. Yet I have played Assassin's Creed II three times, as recently as last year. II took every great idea from Assassin's Creed refined most of the rough edges, and added even more to love. II kicked off a trilogy of titles (with Brotherhood and Revelations ) centered around the Renaissance-era Italian protagonist Ezio Auditore. That trilogy is regarded by most fans as the series' heyday. To this day, the mobile-game spinoffs Ubisoft makes are still set in this era, if that tells you anything. While Assassin's Creed 's fresh ideas were janky and unfinished, realized them fully. It's definitely not perfect, but it's a great game. Brotherhood took Ezio to Rome, but not at the time of the Roman Empire , of course. This was a dilapidated Rome. This game had multiplayer for some reason. I actually forgot about it until I was fetching this screenshot. It was not exactly the best part. The core gameplay was almost identical to that of Assassin's Creed II . Brotherhood was a direct sequel to II and more of the same. While II had some gear upgrades, Brotherhood introduced much deeper progression systems that would become a key part of the series moving forward. Many people consider it to be the best in the series, and I enjoyed it immensely, but I was not as engaged by its setting, and the freshness of the first two games had faded a bit-the first sign of what a curse the series' too-frequent annual release schedule would be-so I remember II more fondly. Still, this game was in the series' sweet spot. Revelations was a good game, but it was also the first time since the forgivable experimentalism of the first title that the series stumbled a little bit for me. Ubisoft claimed they wanted more action set piece moments in this one, but trying to cram Naughty Dog / Uncharted -style on-rails moments into a systems-based game was confusing at best, frustrating and worst. Further, this is when Ubisoft started putting in entirely different, less-good games and systems unrelated to the core experience-in this case, the awful tower defense minigame for territorial control. In Revelations these down moments were edge cases in an otherwise good game-after all, the problems were on the fringes, but the core gameplay built nicely on top of the previous titles-but the problems that would be all-pervasive in future titles planted their seeds here. The protagonist was a Native American boy, and the primary weapon was a Tomahawk-a signal of a modest departure in the combat system. There was the infamous final mission, which had you dashing through a burning building chasing an enemy using those controls that only worked the way you expected 33 percent of the time. It was awful-it was almost as if Ubisoft had designed a set piece specifically to show off everything that was wrong with the franchise. Revelations introduced these problems, but III drove them home. In Assassin's Creed IV: Black Flag you arguably spent more time sailing a pirate ship than you did sneaking or stabbing. Combat was not a big departure, with only iterative changes. The animation-locking combat system was not in too bad a state at this point, though. There were cities in Black Flag but they played a much smaller role in this game than in any other in the franchise. I have trouble making helpful assessments of Black Flag as an Assassin's Creed game, because 70 percent of it is not one. III introduced a series of boat combat missions. I thought they were the best part of a bad game, and so did some other people. Similar sailing gameplay played a big part in IV which cast the player as a pirate in the Caribbean. But you could easily spend more time on your boat than you did with traditional Assassin's Creed stuff. Remember how Revelations had problems because it had separate-seeming games like tower defense? IV went nuts with that. I'm not sure I could even count how many different games were packed into this one disc, and they did not all appeal to the same type of player, giving pretty much everyone something they just wanted to get over with to get to the good part. The systems like underwater diving, boat combat, ground combat, ground combat on boats, ground stealth, boat stealth, collections, mission tables, resource management, and so on were disconnected from one another and did not support any one core experience. 19659010] In a systems-based game, the systems have to interlock and talk to each other to create emergent stories for the player. When they're disconnected from one another this way, it just feels like bloat. A lot of people like Black Flag and that's fine. But it was a game co-developed by a half-dozen different Ubisoft studios, and it felt like it. Also, Black Flag was way too long to be an annual release. Finishing it before the next one came out felt like pressure-as I recall, I only managed to complete it a couple of weeks before Unity hit. I was really starting to feel the fatigue.